Susie's sick, but the doctor gave her some 'cillin or other, and I got another day off, at least. This is my annual "forgot to write anything until the last minute, so I'm writing that I forgot to write anything" post. Hey, it counts, right, Eden? Woke up this morning a little early, and as we were sort of coming around, there was a great flash outside. A few seconds later, as expected, thunder. Susie went to the window, and said, "Hey, it snowed!" There was about an inch on the ground, which was nice for the kids. Then the thunder and lightning picked up again, and it began to hail. Pea-sized hailstones covered the already-fallen snow. Fortunately by the time we got up and out it had stopped, and turned to a more manageable flurry. Now we're packing up, and getting ready for the early flight tomorrow. We were thinking we had booked a later flight, but when we checked, it turns out we're on the 8:45 AM flight. So, up at 4:30, but all in all it's been a good trip. We've had three days on the ground in Dublin, and we've had a really good time. 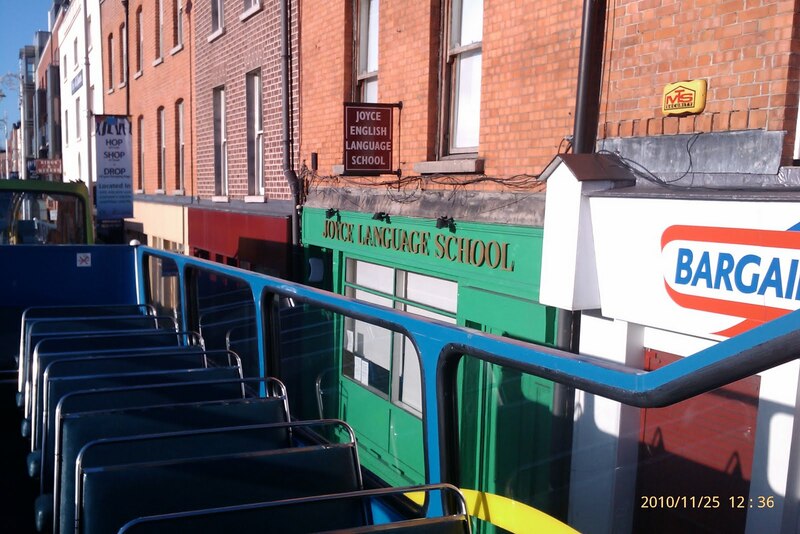 We took a bus tour around the city that showed us lots of sights (and led us to the new Dublin drinking game, "failed revolution"). We saw the National Leprechaun Museum, which was pretty cute. We toured the Guinness Storehouse, and learned how my favorite beer is brewed (and got a couple of samples, and had a great lunch). We saw the latest Harry Potter movie in a decent theatre. 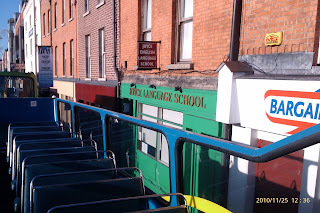 We visited the Dublinia exhibition, and the National Wax Museum Plus, which I have to say, while a bit disappointing, I preferred to Madame Tussauds. We got some souvenirs (mostly sweaters from Trinity Sweaters and rugby shirts, and a cool travel mug). I think we all had a pretty good time. And I still have a couple of days off before I have to go back to work. Here we are in Dublin, well known for its Thanksgiving ambience. heh. We wanted to do something different this year, spend the time together, and not worry so much about a massive feast. So this morning, when I reminded the kids that it was Thanksgiving, but we weren't going to have a big turkey dinner, Lily said, "Well, I'll have to do the "Roast Dinner Dance." Which she did. I demanded an encore so I could film it for posterity, and she obliged. And now, for you all to enjoy, the "Roast Dinner Dance." ...or something like that. We're in Dublin. And now, after a minor fiasco with a folding bed for Lily, we're done for the night. We showed up this morning for our flight home, and I was almost immediately told, "Um, so I think you're gonna need to get a ticket home." They got us home after all, on a different airplane (well, I was on the one I thought I would be on, but everyone else came along too...) and after the usual "hi, thanks for going away, here are all the services you can take advantage of" (I asked the lady if she was going to start giving us loyalty cards, so we could maybe skip every 5th briefing, or get a free coffee, or something) I headed home. And that's where I am now. Home. Yippee!! I am headed home in the morning. I should have been asleep a while ago, but I just finished packing up. Fortunately I'll get to sleep on the flight home, so that's nice. Did the big "Chapel Run" today. 5.09 miles, 1 hour and 3 minutes. It wasn't that bad, either. The steep winding bit I mentioned was just as steep and winding as I had feared, but a judicious bit of walking on the uphill (maybe a total of 1.5 minutes) left me ready to go for the rest. So that was the only walking I did... go me! So it turns out I don't mind distances so much, so long as there's no pressure for me to "hurry up, keep up with me!" from anyone. So maybe I'll do some more distances. Next time from the UK! Ran 1.5 miles for time today, and I have improved my time by 30 seconds in three weeks. If I keep this up, I will be quite happy with my time when I redo this stoopid test. Tomorrow Carrie has "The Big Goodbye" run planned... it's a 5-miler, with a steep hill down then back up at the halfway mark. I'm told it's a beautiful run, and we don't do it for time, we do it for "let's do a long run today." Which is good, because my back, it is achy. And on the even BRIGHTER side, in 48 hours I should be home. Can I get an "amen"? The name's Jones. Forgetful Jones. Don't you hate it when you have something to say, something to tell someone, but the time isn't right, or the person isn't there, and by the time you get into the right place or the person shows up, you've forgotten it? Yeah, so that's what happened with this post. I was thinking about it during my 4-mile run today. I thought, "Oh, that'd be a good blog entry!" I even remember that I had an opening sentence and a title. But I don't remember what they were. So, since I don't have anything important to say, I'll just call it a night. Because I have to get up in about 10 hours, even though it's barely dinner time. Day off today, which is normally a good thing, except that I had anticipated spending it en route home. So it was a mixed bag today. I was going to write some, but I just wasn't "feeling it." So I did some laundry, and watched a whole bunch of "The Big Bang Theory." I'm told that they're arranging me to go home in the first wave of folks headed back on Tuesday, which should get me in reasonably early, in time to complete the usual "welcome back, now do this" nonsense, and so I won't need to come in on Wednesday. Boy, I wish I could take a whole BUNCH of time off right now... not feeling particularly charitable toward work. Well, I finished doing all the training I needed to do, and was all set to go home tomorrow. I had tickets in hand and everything. Then the back home boss said, "Hey, why is this the first I'm hearing this? And isn't this going to be expensive?" After much backing-and-forthing with the back-home folks, the decision was made: I'll stay here with everyone else. If, for some reason, the departure of everyone else doesn't happen on time, then I will be allowed to run across to the airport and fly home commercial. See, apparently it's not the money, it's principle. Apparently the guy back home (a mid-level boss, above me) who knew this was the plan didn't share this plan with anyone. Don't know why, doesn't matter right this minute. But then he decided to take some time off. So, when Doug, the leader of the group that I came here with, and who knew of the plan, told the boss here I needed my travel arranged, he said, "What? Who said he could leave?" Because although we've been talking about this since I arrived, no one "officially" told them here that I might leave early. So they called back to the home folks, and, as I said, they didn't know about it either. Of course. So, they will pay for me to get home in time to go on my pre-paid non-refundable trip, but they've decided that they will only do so *IF* at the last minute the other plans fall through. Rather than avoid the possibility. Whatever. I *will* get home soon, and we *will* go on our trip. Today was cardio day. That meant the 4-mile run thing like last week (half mile warmup, stretch, 3.5 miles). Today, however, we managed in at least 5 minutes faster than last week! Woohoo! That translates, sort of, into at least a minute off my 1.5 mile time, especially as today we weren't trying for speed, just a consistent pace. I'm quite happy about it. Susie commented on my post yesterday, and I suspect she's got the gist of it: my abdominal pain has all the hallmarks of a "sports hernia." Sigh. Oh, and the title today? Well, as we were cooling off and stretching after the 20 minute elliptical machine workout following the 4 mile run, the boss wanders into the gym. There's been a bench press competition going on at the gym all day, and he gets points for every one of his people who competes. He's been pushing for people to go and even just lift the bar, it counts. He came over to me and said, "Hey, I just emailed (boss back home), and told him that not only are you doing well on your workout plan, but you even took part in the bench press competition!" Great. So I did. First time in my life I ever benched a press, or whatever. So for me, 135 pounds is impressive. Too bad the guy right before me did 365, and the guy two before him attempted (but failed) at 405. Whatever, I did it. And now I can brag on it. "Yesssirrebob, when I was in the bench press contest..."
OK, so we let my rogue muscle or whatever heal for a good week and a half. And during today's workout, the plan was to get back to some sit-ups and push-ups. I gave it a gentle test yesterday, and first thing this afternoon, and all seemed good. When the time came, I sat down, and knocked out 20 situps. Easy-peasy. So I turned around to try for some pushups. By the time I hit 10, it felt like someone was sticking a knife in my gut. I struggled to get 15, and couldn't do more. 10 minutes later (it was another circuit like yesterday, only with leg exercises instead of arms) and I couldn't even do 3 sit-ups without pain. And no pushups. BUT... I could do crunches. And I could do push-ups on my knees, no problem at ALL. And I could do one "oblique" exercise, but not another. As I said before, "Not good." I have an appointment with the doc for Thursday morning. I hope he's got a magic pill, because I'm really really starting to fear that this might be more serious than just a pulled muscle. I'm pooped. Not just body, but brain as well. This place, for all its good bits (no sand, no ... well, no lots of things) is a soul-sucker. Yep, we just had two days off, and they were GREAT. But back to work today... and I'm just done. Nothing specific, no terrible thing happened, I just realized that I'm really REALLY ready to be home. I had a little lunch a bit ago, and came down to my room to write this entry, and of course, the net was feeling wonky and wouldn't connect. So I sat on my bed to read a bit, and nearly fell asleep. Now, that wouldn't be so bad, since I have to get up at around 1:00 AM, but then I wouldn't have blogged, and we can't have THAT. Fortunately, nature called, and when I returned, the net was back. So I'd better post this before it goes away again. Oh, and the workout today? Circuit, sort of: 5min treadmill, then 15 each Chest Press, Shoulder Press, Lat Pull Down, Biceps Curl, and Skull Crushers. Then 25 crunches on a big ball (like a hippity hop or space hopper?) then 25 reverse crunches, then 1 minute bridge (head and shoulders on ball, lie out flat with knees bent 90 degrees to support your weight, keep the body straight). Then a quick break, grab a sip of water... and do it again. 3 sets. Then 15 min cardio. That was me, a typin' fool. I actually got my 1700 words in today, and a few extra to boot. I'm at 3600 words or so now. I reached a good stopping point, and while it's not a "complete story," it's at least a "complete introduction," I think. I also went back and re-read it. I didn't like the way it read, so I changed from third person to first person. I think it reads better now. Back to the workout tomorrow. Not exactly sure what Carrie has in mind for me, but it's sure to be just gangs and gangs of fun. Susie says the wedding reception went off very nicely at our house yesterday, for which I am very glad. I'm sorry I couldn't have been there to lend a hand, but that's done, and some of Susie's other obligations have been completed as well, so things should be a bit calmer around the old Wit Farm/Knit Farm. Things are looking good for me to be able to get home in time for our family trip to Dublin, but I still can't say for sure. That's disappointing, but I should know soon. I'd hate to miss out on that. This is a pretty chatty post, isn't it? Well, and why not? It's just us friends, right? Well, not so secret, I guess. I mean, anyone who writes a blog probably has the same secret: I have literary ambitions. I was reminded that, in addition to being NaBloPoMo, it's also NaNoWriMo. And if I'm going to participate in THAT, well, I'm WAAAAAY behind. I think I write fairly well. I like to read, and I know what kind of stories I like. And I think I can, given time and opportunity, write one that's a good enough story, written well enough, that it might actually amount to something. Yes, I'm about to commit "Attempted Novel." It's an idea I had some time ago for a science fiction novel that contains the ever-so-slightest bit of ripped-from-my-life truth. And by "slightest" I really mean that. This isn't one of those thinly disguised autobiographies that turns me into a great hero or something. Just one or two things that happened to me, that I thought would be interesting to explore on a grander scale. The NaNoWriMo challenge is 50,000 words in 30 days, which is just about 1666 words a day. There's no way I'm going to get 21,000 words written by the end of tomorrow, but I had a day off today, so I sat down and got 1700 written. And I have another day off tomorrow. If I can sit down and get another 1700 words in, who knows? Maybe I'll actually finish it...someday. 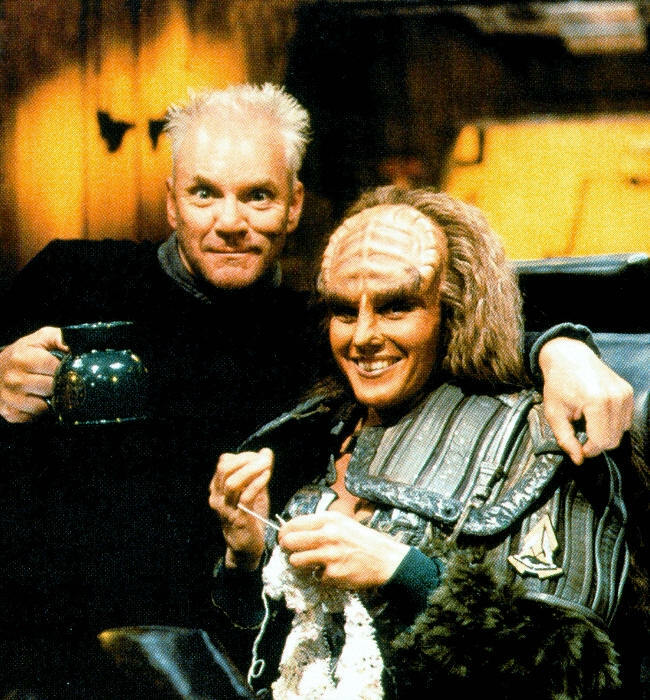 Ever wonder what Klingons do when they're not fighting for honor and glory? I know, it's not knitting, exactly, but hey, it's a "yarncraft," right? Why? Because today, as Carrie so gently put it, "we destroyed (my) arms." Supersets, biceps and triceps. And I'm such a wuss that on one of the exercises I could barely manage a 10-lb dumbbell. Sure, some of the others I was up as high as 40 pounds, but that one damn exercise (isolated bicep curl) just plain got the better of me. Of course, that's good, I suppose, as now that we've found a weakness, we can get rid of it. But back to why I consider myself lucky. It's because the stiffness from today hasn't set in, and so, for right now anyway, I still have the capacity to type. Tomorrow I may not be able to reach into my own pockets. Tomorrow, I think, I'll get on the scale and see what the last 11 days have done. Extra post for today -- DON'T PANIC! See below for my real post, but this one is just to confirm that yes, I changed the look of the blog today. Maybe I'll change it back, but I felt like mixing things up a little. Crazy. I got some new running shoes the other day, and I got to break them in today. They're the first running shoes I've had that are actually wide enough that they don't pinch even a little, and I was very excited to find them. It was a good thing, too, because my old ones should have been replaced 6 months ago, but I never got around to it. And today I really needed them. We started with a light jog to warm up... a half mile. Then a quick stretch, and off for the run, about 3.5 miles. On a hilly road we call "the geep* trail." That was pretty hard on my feet, but fortunately, even when they were a little swollen from the pounding, no pinches! Yay! Oh, then I followed up the run with 20 minutes on the elliptical machine. Then 20 minutes of some gentle non-oblique-stressing core work. Then (bliss!) 10 minutes in the sauna. Yeah, that's gonna become a regular thing, I think. Oh, no. This is becoming a workout blog. I'll have to think of something else to write about soon, but it's just that this working out thing has sort of taken over my life. Sigh. My workouts proceed, coached by a genial demon (sorry, Carrie) who really seems to care that I get this right. We've been doing a program that balances strength training and cardio, using a lot of running (both out on the road, and indoors on treadmill/bike/elliptical machine) with weight machines/free weights added on several days each week. Oh, and core stuff (the pushup/situp type thing). Here's the problem. I think I pulled something during my fitness test. And it's either an abdominal muscle, or an "oblique". It was quite painful after the test, as in it hurt whenever I needed to, say, get out of bed, but the pain dwindled. Unfortunately, it's not gone. It's now limited to one very specific spot, and I only feel it when I do push-ups, sit-ups, or crunches, or similar exercises. But when I feel it, WOW, do I feel it. Almost a stabby feeling. My first fear: hernia. Fortunately, I have none of the other symptoms. From everything Carrie and I discussed and researched, it's almost certainly a pull or strain or something of one of my obliques. This isn't great, because, as you may recall, the test involves... push-ups and sit-ups. And so my training needs to strengthen those, but I can't do any of either right now. We're working around it, for now, doing all sorts of other core stuff, but this needs to get better. We've decided to go very easy on the obliques for the rest of the week, don't do anything that even twinges, and then, on Monday, if there's still pain, I'll have no choice but to go to the doc. I have no idea what time it is right now... not because my watch is broken or anything like that, but because I'm on this crazy shifting schedule. I had to leave for work this morning at 2:30 AM. And tomorrow I have to leave at 1:00 AM. Yesterday I had a day off, but the day before that I went in at 5:00 AM. It feels like it should be dinnertime, but really it's just past lunchtime. And I have to go to bed in the next couple of hours if I want to get my sleep. This is the number two challenge for me in keeping up with NaBloPoMo this time around... I feel like I just wrote yesterday's entry. Challenge number one, of course, is thinking of something to write about. Oh, and back to the workout tomorrow, after the weekend off. Wish me luck. I just got a call from my sweetie. I had spoken with her a few days ago, and at that time she was quite upset. You see, some friends of ours are getting married next weekend, and we volunteered to let them have the reception at our home. Susie was looking at the state of the house and despairing of ever being able to get it ready for 60 guests. We talked for a while, and I talked her off the ledge when we realized that even though the whole project seemed huge, taken a room at a time it was actually quite doable. So that's what she's done. In the past two days, with some help and moral support from the bride-to-be, and no help but moral support from me, she's ruthlessly decluttered most our house. She's nearly done, and on Tuesday she was afraid it was impossible. Talking to her just now, it was easy to hear the relief and happiness. It's amazing how sometimes just jumping in and attempting the impossible helps make it possible, isn't it? What EVER shall I do with all my time? I've got a day off tomorrow. Those are few and far between for those of us who come down here to our Greek paradise. We've been here since mid-October, and this will be our third day off... and the other two were at the very beginning, when we didn't need them so much, but some of our guys got sick and we couldn't do the work we needed to do. So, I have to figure out what to do. I could go downtown, wander around, see the sights. But I've done that a few times, and seen most of the stuff there, and I'd only be tempted to eat something. THAT, friends and neighbors, is something that I cannot afford to do right now. Actually, that pretty much leaves me one option: Sleep late, sit around on the balcony and read, maybe borrow a DVD from someone. Come to think of it, that's not such a bad choice after all. I hate writing performance reports. It's an exercise in frustration. I have X lines to summarize a person's performance over the last year, in a few specific areas. But I can't just come out and review the performance. No, I have to say it in specifically formatted, space-limited, bullet statements. "Joe is an outstanding mechanic who always comes to work on time and does his best. He's the most reliable person here, and knows everything about everything we do. He should be promoted immediately!." "How exactly was he key to mission success? Was the fleet 100% ready at all times, or do you mean we met tasks even if we had some broken buses? Did he fix them by himself or did he have a helper? Did he really fix all 25 engines, or did he just do maintenance on some?" And it just goes on and on. Oh, and I have to adjust these because the bullet has to fit exactly on the line. No "white space" at the end allowed... ok, MAYBE one space. And there are some 20+ lines on the form. It's annual performance review, Twitter-style. So, day three of NaBloPoMo is also day three of my new fitness regimen. So today, I ran nearly two and a half miles... and then did 30 minutes on a stationary bike. My legs are SORE. I'm so whipped right now my brain can't think of a thing to write about. But hey, even posting THAT much counts, right? I have a job that requires physical fitness. That is to say, I must take (and pass) a test of my fitness twice a year. Push-ups, sit-ups, a timed run, that kind of thing. It's not that hard a test, frankly. I keep failing it. Oh, I've always passed on the re-try, but as I get older, it sure gets harder. And they've just made the standards a bit tougher, too. I'm back in the Greek island where I've spent so much time in the past two years, and finding time to work out is difficult with our schedule. And I'll be honest, I really hate working out anyway. But two years ago, Susie and I were rocking a great new diet plan, we'd lost bunches of weight, I was in decent shape (still struggling to pass the test, but doing much better generally), and things were looking good. Then things happened. I got selected for some specialized training, and I was away for 4 months. I was still doing OK, and even though my test came due during the training, and I failed it, I not only made it on the re-test, I voluntarily retested at the earliest date, rather than the latest as I would usually have done. Then, when I got back, it was Thanksgiving. And then I got sent away for three months over Christmas. The usual holiday pounds started to creep on. Then when I came back, I was due to test. I motivated myself to do some extra work at home while I was off work for a while, and I surprised the heck out of myself by passing the first time. A squeaker, to be sure, but a pass is a pass. Then I got sent away again, back to this little brown Mediterranean island. I let myself slide. The weight crept back up. The run times got slower. The waist measurement got bigger. I began to dread the test. I got back home, and they assured me that there was NO WAY I was going anywhere until next spring. Good, I thought, I can use the next two months to get back in shape. One guy at work is running a Crossfit class, so I planned to get into that. Things looked promising. So a week in the hospital with him (it was pretty serious, it turns out), then a week at home recovering from that stress, and toward the end of that I get the call. "We need you to go to Greece in three weeks." Crap. My plans shot, I zombie my way through the next three weeks, and get to Greece, all the time knowing that I haven't got a chance in hell of passing this test. I was right. Last Friday, I failed my fitness test. I'm disappointed in myself; not because I failed, I sort of expected that, but because I let myself get into that state. Again. Which means now I am required to work out, with a sort of personal fitness demon, 5 days a week. Actually, like ripping off a band-aid, I'm glad it's done. I hate to work out, but I'm doing it cheerfully (no snickering!) and I will pass this test. I've gained back all of the weight I lost, I've spent more time away from home than at home in the past 2 years, I miss my wife, I miss my kids, my wife has got worries of her own at home and there's nothing I can do from here to help, and it's all dragging me just a little bit... down. The worst part is, the ONLY one of those things I have ANY control over is the weight/fitness, and it's about my least favorite thing in the world. So yeah, I'm not in a great place right now. I'm just grateful that I know that my wife and children love me as much as I love them, and will continue to do so, no matter what. I should be sleeping. In fact, I was just lying in bed about to fall asleep (couldn't sleep earlier, and a VERY early wakeup coming. Sigh). Then I remembered NaBloPoMo. Wasn't going to do it this year. Mostly because I seldom keep it up very long afterward. But I always want to. And I enjoy it. Me: So, what meat do you have? Food Drone: [points at pasta] This. Me: Oh... is there meat in it? Me: Oh, so if I want meat...? Me [spotting egg-muffins in warming case behind him]: What about those? Drone: Those are for breakfast. Me: So is it breakfast now, or dinner? Me: So, then, can I have one of those? Drone: No, they're for breakfast. Me: [sigh] I'll take some pasta, and some bacon. Drone: Sorry, only one meat. Me: [walks to other line, sees nice crispy bacon] Oh, can I have some of that bacon? Drone2: No, you already have bacon. Me: But it's hardly cooked and [realizing as I touch it] it's ice cold. Drone2: Sorry, I can't give you more. Me [irritated, waving handful of greasy cold undercooked bacon]: Then I'll give you this back! Drone3: Can I help you? Me: Yes, please, I'd really like some cooked bacon. Me: Can I get you to throw this soggy mess of undercooked stuff away? Me: Seriously, would you eat that? Me: So why serve it to me?? Every once in a while, while we're down here in the hot sandy place-- Oh, didn't I mention that I've been in the hot sandy place since just before Christmas? No? Ah. Well, I have been. But I'm going home soon, so no matter. Where was I? Ah, yes. Every once in a while, we get a morale tour through here. Think USO, Bob Hope, like that, only not as cool. The Washington Redskins Cheerleaders. A band called "Saving Abel." Four NFL guys whose names I frankly couldn't be bothered to learn (although I am grateful that they took the time to come visit, really, because there are some real football nuts here, it's just that I'm not one of them, and... oh, tangent again. Sorry.) They're OK, these tours, and as I just said, they do show that folks care, and they do boost morale, if you're into whatever they're famous for. Which leads me to today. Take a look at these guys. Do any of them look familiar? Maybe not, but I know you know at least three of the names. They're arranged onstage from left to right in approximate order of coolness, in my opinion. Ready to find out who they are? OK, here goes. Steve Ritchie. 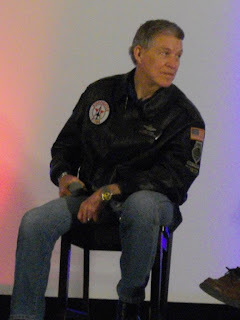 Retired USAF Brigadier General, and America's last fighter ace. Shot down 5 MiG-21s in Vietnam, including two in one day (within 2 minutes). In 2007, at the age of 65, he requalified on the F-104 Starfighter, which he still flies for fun and profit. 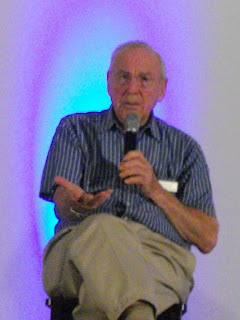 Jim Lovell. Yes, that Jim Lovell. No, he doesn't look much like Tom Hanks, but this is the guy who made the most famous understatement of all time, "OK, Houston, we've had a problem here." 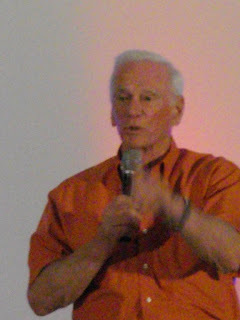 Gene Cernan. 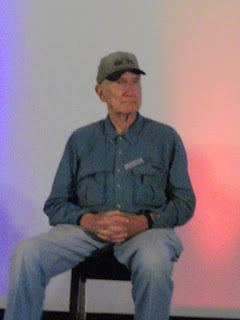 Commander of Apollo 17, and the last man to walk on the moon. Who could possibly be cooler than that? This guy. Neil Armstrong. You don't know how tempted I was NOT to hyperlink his name, because if you don't know who he is, shame on you. Cheerleaders? Football players? Pfft. These guys are literally names from your kids' history books. It was a real treat, part of a "Legends of Aerospace" tour. The moderator for the panel was David Hartman, former host of Good Morning America (and, incidentally, former USAF officer...) They started with a very cool intro to a darkened room: "Only 12 people have ever walked on the moon. Two of them are here with us this evening. Only three people have ever piloted a crippled spacecraft safely to earth. One of them... is here with us this evening." And so on... Then a multimedia presentation about the careers of each of them, followed by a panel discussion led by Hartman. 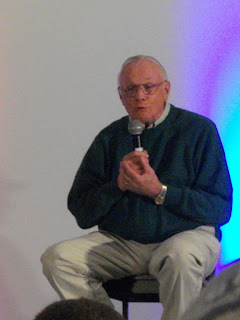 At one point Neil Armstrong was telling about fears that the lunar surface might not be solid enough to support the lunar module. He described how careful they were to be prepared to take off on a moment's notice, if need be, but as it turned out, the surface was firm and rocky. "A lot like this place, actually!" 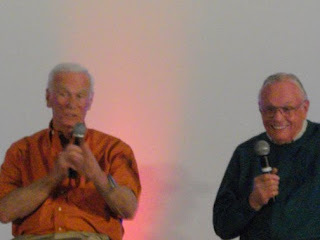 said Cernan, causing the audience (and Armstrong) to break into laughter. I got a bunch of pictures, but they're lots of "Lovell looks amused" or "Cernan seems interested" types of things. Cool, in their own way, but I'm not gonna post them all. I'm just really happy that I was able to go. This type of tour really is the stuff... the RIGHT stuff.